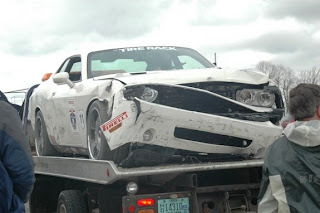 "Coming into turn 1 at the end of Road America's long straightaway, the Vanishing Point Challenger got loose, went into the infield grass, and then hit the tire-pile on the outside wall hard enough to fly up right on top of it. Driver Erich Heuschele was unhurt, but the damage, as you can see, was pretty catastrophic. The team says the Challenger is out of the race, which is terrible news. But astonishingly, we saw the car shortly after our own run leaving the track under its own power—and passing us! " Maybe its dead, maybe not. Cobb R35 GT-R 506 AWHP. Get an R35 GT-R at MSRP - Right now. The Truth About Cars ?